Fall has officially arrived! And around here that means it’s “pumpkin time” – one of my favorite times of year for baking! I get so excited when I see the market brimming with sweet pumpkins fresh from the field, and of course, the shelves filled with canned pumpkin puree too. I can’t help but turn on the oven and start baking up lots of delicious pumpkin treats! This week alone, I’ve already made my popular grain-free Pumpkin Muffins twice to bring to various breakfast meetings, since they’re always a huge hit! And this morning, I just had to make my personal favorite – Pumpkin Pie Porridge – the ultimate warm and creamy breakfast for cool Autumn mornings! 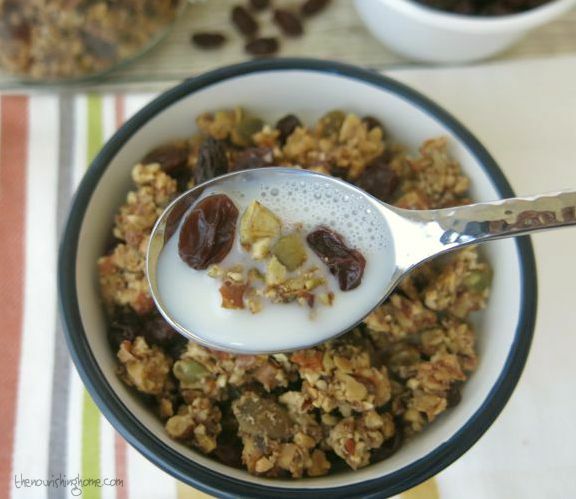 Another breakfast favorite around here is granola. We adore it solo with a splash of almond milk, as a sweet and crunchy addition to Fruit & Yogurt Parfaits, and it also makes a wonderful afterschool snack. In fact, you might say we’re just a little nuts about granola! 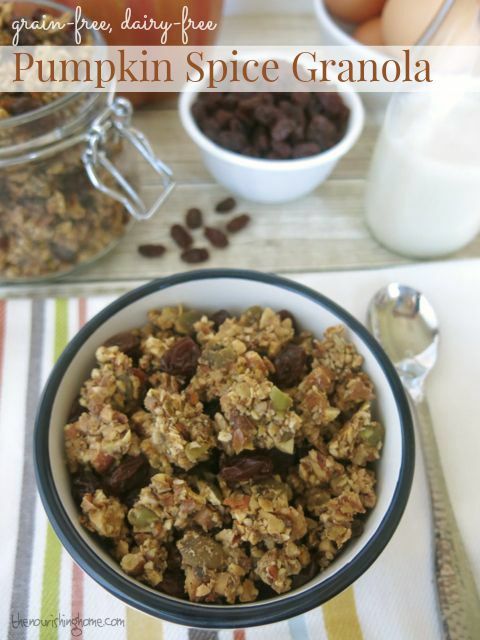 That’s why when I started thinking about sharing a new fall-inspired recipe with y’all, the first one that came to mind is my scrumptious Pumpkin Spice Granola! This delightful granola is not only gluten-free and grain-free – it’s also dairy-free and egg-free as well. This crunchy pumpkin pie flavored treat is a delightful spin on my popular Vanilla Cinnamon Crunch Granola. If it’s your first time making granola, be sure to check out my “How to Make Grain-Free Granola” photo tutorial to learn just how easy (and delicious!) it is to make your own homemade granola. In fact, I should probably warn you … with just one bite, you may find yourself becoming a little nutty over homemade granola, too! For the Nut Mixture: Place the nuts and salt in a large bowl and cover with warm water. Cover the bowl with a clean kitchen towel, and allow the nuts to soak 18–24 hours. When soaking time is completed, drain and rinse nuts. Place on a clean kitchen towel to absorb excess moisture. For the Granola: Preheat oven to 210°F. Line a 12´ 17-inch rimmed baking sheet with parchment paper. Set aside. Add the finely chopped nuts to the bowl with the maple-honey mixture. Continue to pulse the whole nuts a few handfuls at a time until finished and continue adding them to the bowl with the maple-honey mixture. Once all the nuts are ground, use a rubber spatula to fold them into the creamy pumpkin mixture until well combined. Return granola to the oven and bake another 2 hours. Then repeat the process of gently flipping the granola. 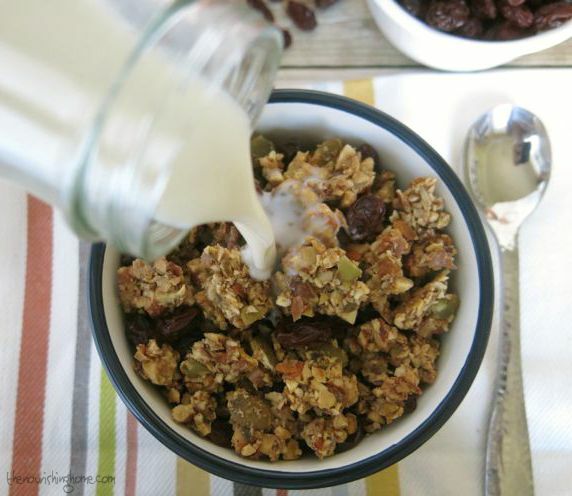 Return granola to the oven one more time and bake another 45-60 minutes. Turn off the oven. 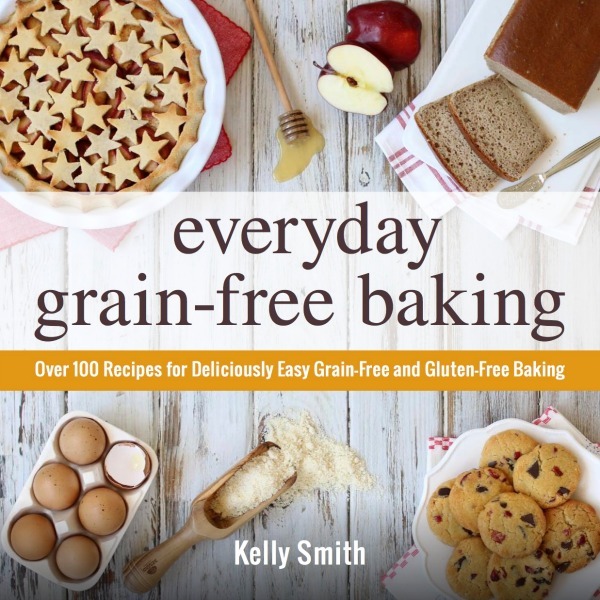 Place the baking sheet of granola on the stovetop to cool. After about 5 minutes, check the granola for the crunch-factor. If it’s crunchy enough for you, allow it to continue cooling. (It will get crunchier as it cools.) If it isn’t crunchy enough, return it to the warm oven and allow it to sit in the warm oven for 20–30 minutes more until it reaches desired level of crispness. 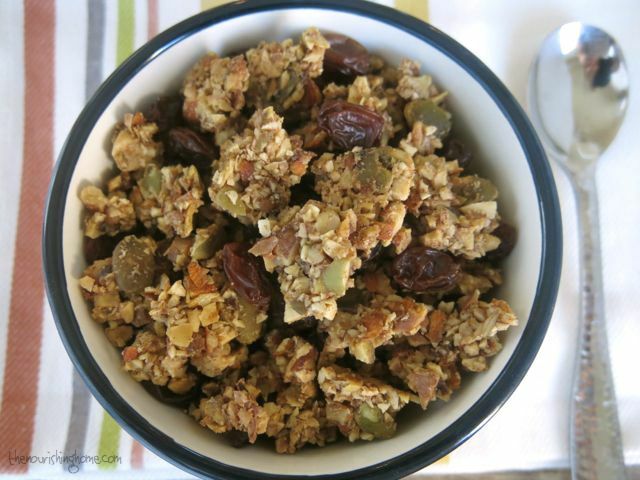 Allow the granola to completely cool, then immediately transfer it to mason jars, or other airtight containers. Store in the pantry for up to 2 weeks or in the freezer for up to 3 months. Enjoy with a splash of your favorite milk, or use it to create a healthy snack mix. Simple Healthy Breakfasts in 15 Minutes or Less! Kelly, this granola looks so good! I’m partial to granola clusters especially, so knocking on your door for a handful is awfully tempting!! Great minds think alike! I just posted a granola with the same name. Different methods though. Can’t wait to try yours! Just reading this trolling for Whole 30 ideas. I was excited til I saw the sugar…I know I could leave it out but I’m just starting this no sugar thing and I’m thinking..pumpkin without sweetener?? Can’t wait to try after I’m off this diet, ore more used to having less of a sweet tooth!! Looks great!